First of all, I booked my ticket via the Ethiopian Airlines website and for some reason never received an itinerary. Luckily for me, I’d saved the payment confirmation page and that’s what I ended up relying on as proof of my booking. Dulles – Addis: In typical Naija style, I had 5 pieces of luggage to check-in. I arrived at the airport 2hrs before my flight, thinking Ethiopian Airlines was a regular airline and everything would be sorted with ease…far from it! After staying on the long queue for over 30 minutes, I finally checked-in and then was transferred to another long queue to pay for my extra pieces of luggage. I’m not sure why I had to join one queue to check-in and another to pay for excess luggage. Sounds like inefficiency to me, and additional time that could have been saved. Anyway, I stayed in the second queue for over 25 minutes and finally got to pay for my 3 pieces of extra luggage (200usd per bag). I had spent about an hour and 30 minutes to complete the entire check-in process and go through security, so I was a little concerned that I’d miss the flight. However, the check-in queues were still long when I was wrapping up so I figured I was fine. The flight ended up getting delayed without any warning, explanation or apology. We eventually took off and boy was this an awful flight! There wasn’t much I liked about this flight to be honest. Take off and landing were very smooth and the food was actually quite good (had some nice pasta dish and a very lovely hot sandwich). Everything else on this flight was below my expectations. The seats were very uncomfortable for some reason, and it was difficult to recline. I was seated in the exit row and had asked one of the air hostesses to move me as I wasn’t sure I could perform the duties required of those who sit in the exit row. Her response? “Sorry the flight is full, there’s nothing we can do“. Imagine!! Isn’t it a requirement to ensure passengers seated in the exit rows can perform those duties if required? I sat in my seat uneasy with the conversation that had just transpired, and about 5 minutes later, the air hostess I’d spoken with returned with one of her colleagues and asked if I still felt like I couldn’t perform the required duties. But at that point I was already skeptical of their competence and the kind of training they’d received, so I figured that I might actually want to be seated right there just in case anything went wrong. So I told them I was fine. Being in the emergency exit row, I couldn’t easily locate the USB port to charge my phone. I’d asked one of the attendants and she was so dismal! Of course she couldn’t help and of course I didn’t locate the USB port so my phone was dead for majority of the flight (thank God I’d charged my Kindle). I had an aisle seat and the attendant hit my feet almost every single time she walked through with the trolley cart. That was quite annoying. In addition, once we were airborne, I realized that the lady next to me some way some how had like 4 pieces of hand luggage (aren’t you allowed only 2?!?). I’m not sure how she was allowed to get on the flight with all 4, but it immediately made sense why a lot of passengers (myself included) found it difficult to locate overhead space for our hand luggage. 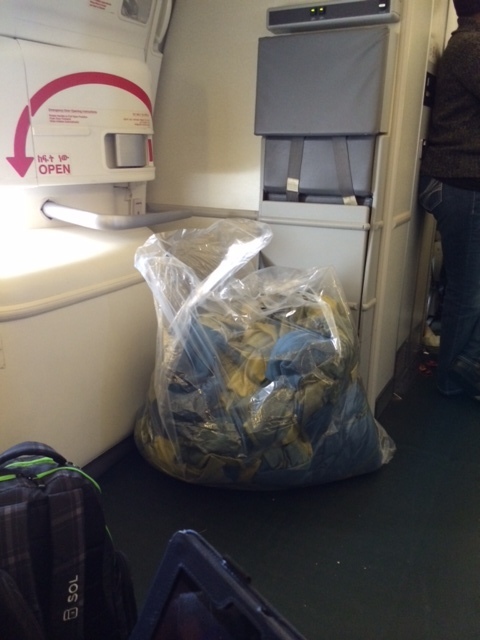 As we prepared to land, the air hostesses had gone around to collect used blankets. Guess where they left the bags of blankets? RIGHT IN FRONT OF THE EMERGENCY EXIT DOOR AND IN THE AISLE!!!!! 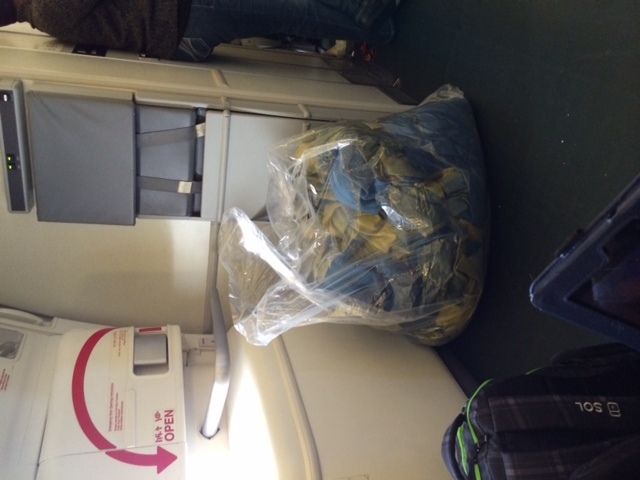 These bags sat there for like 20 minutes and were moved into the toilets as we were about to land! I’m not an air hostess or anything, but I’d think it’s a MAJOR security hazard to obstruct the emergency exit and aisles, especially during takeoff and/or landing. 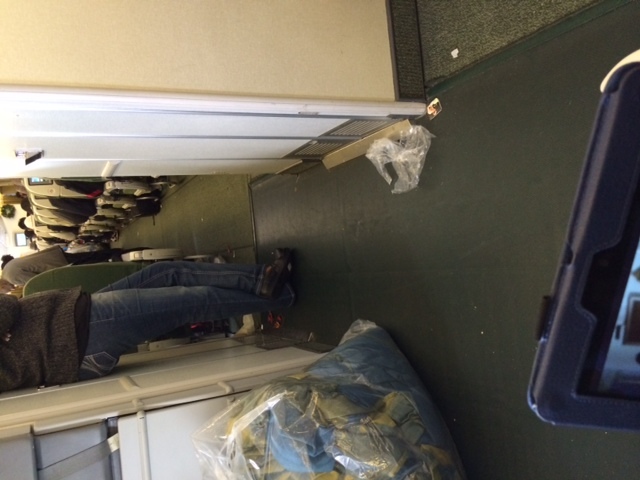 Spot the backpack in the left corner and the bag of blankets RIGHT IN FRONT OF THE EMERGENCY EXIT DOOR! Layover: There was chaos once we landed in Addis. It seemed like everyone on the Dulles – Addis flight had a connecting flight and was freaking out because we’d been delayed. I was lucky enough to make my connecting flight, but I’m sure other passengers might not have been as fortunate. I must say though that the air hostesses did a very poor job at calming people down and providing enough instructions to assist connecting passengers. I personally didn’t hear any announcements, and the only reason I was able to locate my connecting gate was because I asked multiple people multiple questions to be sure I was going in the right direction. Overall, transit via Addis was quite unpleasant. Addis – Lagos: I had a window seat and slept throughout this flight so not much to say here about service on the flight. Take off and landing were pretty smooth. It appeared the flight was filled with traders. Lagos – Addis: Check-in was normal Lagos check-in; fill out forms, go through customs, settle people as needed etc. I went through security and chilled at a bar before proceeding to the stated gate for my 1:15pm flight to Addis (I headed for the gate around 12:30pm, but made a quick bathroom stop before proceeding…story on that coming soon). By 1:15pm we hadn’t even started boarding. No announcement, nothing. Well, there was no announcement either coming from the US so I didn’t really expect one going from Lagos to Addis Ababa. Then our plane arrived at 1:17pm. I immediately knew there was no way we’d leave Lagos before 2pm. We ended up taking off at 2:20pm, over an hour later than was stated. Layover: Transit via Addis again…phew! The security line was the worst for me! It moved so slowly and I was almost certain I won’t make the flight..but then I remembered how all other flights had been delayed and had hope that I would make it. Lo and behold, I did make it! Addis – Dulles: We were taken to Rome! No where on my ticket reservation was Rome mentioned!! And I didn’t receive an itinerary so there was almost no way I’d have known we were stopping in Rome. Apparently the plane had to refuel so we stopped over in Rome for like an hour. I was so frustrated! I tried to sleep but I was just too uncomfortable. Also on this flight, the same meal was served for lunch and dinner! I’d overheard the hostess say “we’re out of chicken” almost immediately after she began serving and I was thinking to myself “ahn ahn already?” But I quickly realized that was so because they were serving the leftovers from dinner as lunch. 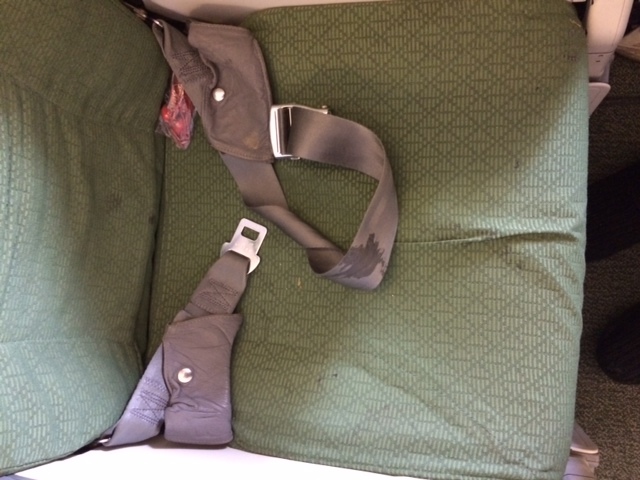 Reclining my seat was also an issue on this flight. I even broke a nail trying and eventually gave up. In addition, the USB port to the left of mine didn’t work, so the poor dude who was to my left used the port assigned to my seat to charge his phone for majority of the flight. 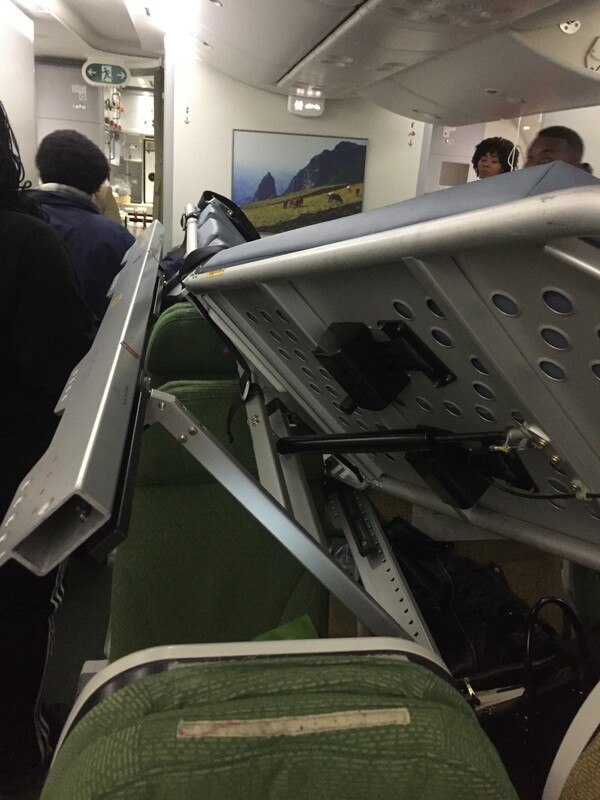 As a side-note, I’m convinced that internal maintenance of the planes is not a priority for Ethiopian Airline management. I’d also tried to use the call button to ask one of the attendants a question, but no one EVER responded! I hit the button multiple times, turned it off and on, etc. The light came on but none of the attendants bothered to stop by. At this point I wasn’t even surprised anymore. I was just ready to be done with this airline. 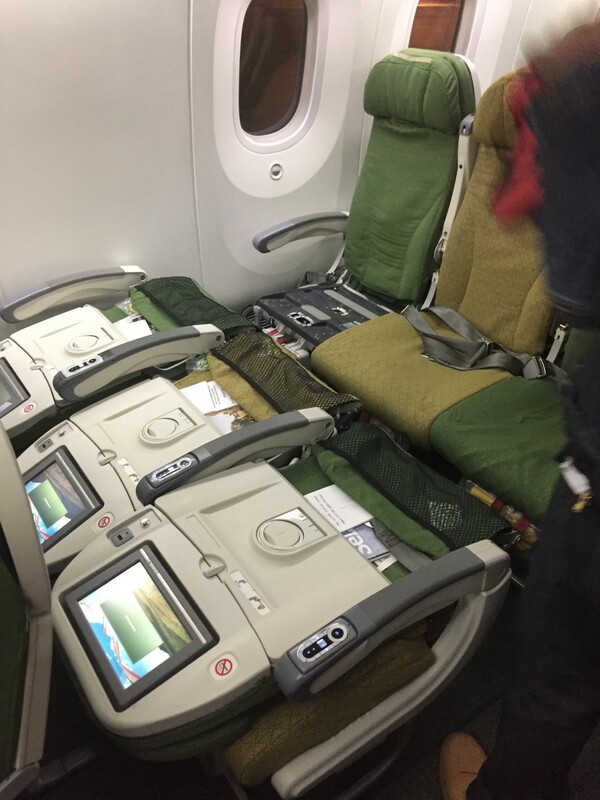 Overall, my Ethiopian Airlines experience was subpar, but it wasn’t all bad. The take off and landing process on all my flights was smooth. The entertainment options were pretty decent (I watched Equalizer, Lucy, and two other African movies), and there was complimentary beer/wine available on all flights. Plus, all of my luggage arrived Lagos and Dulles respectively. The food on the first flight from Dulles to Addis was quite good, but on all other flights was just ok. 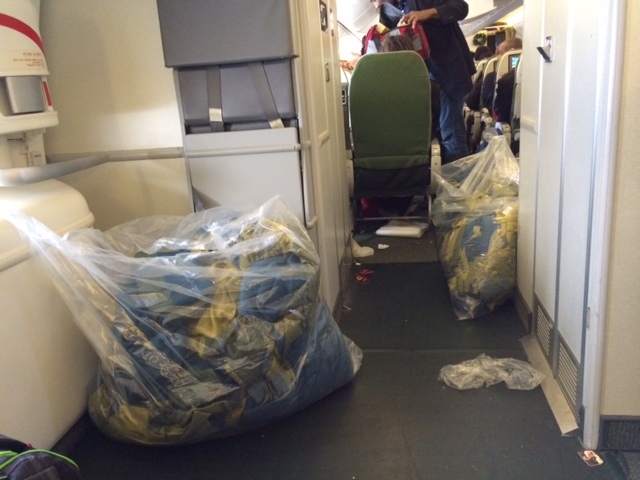 Despite all of this, Ethiopian Airlines is easily the worst airline I’ve ever used in my life. 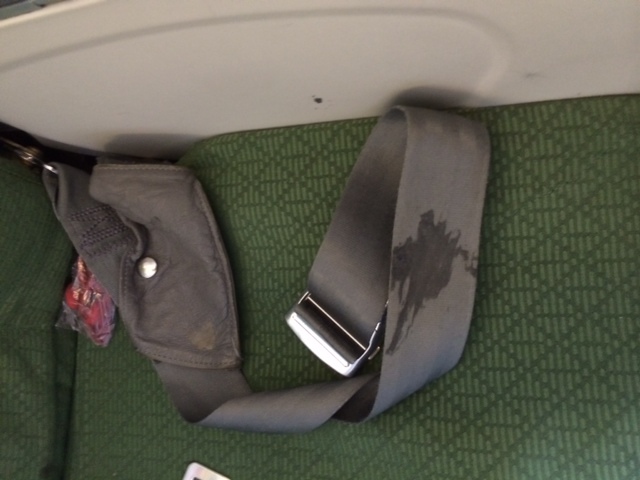 The Ethiopian Airlines planes are old and filthy. Plus, every single segment of my trip was delayed and there wasn’t much communication as to why we were being delayed. Also, communication around connecting flights was poor. In addition, I genuinely feel like it’s a hazard to fly Ethiopian Airlines. I was very disappointed with the air hostesses initial response and lack of urgency to replace me with someone else who was confident enough to sit in one of the exit row seats and perform the duties accordingly. I’d have also liked for better service throughout my flights, and a heads up that the return flight would include a stopover in Rome (this one really took me by surprise). Ethiopian Airlines in my experience is a Lousy airline and I don’t intend on ever using them again (even if I was offered a free ticket!) I won’t recommend this airline. I don’t know where to start with the layers of disappointment I have for Ethiopian Airlines. 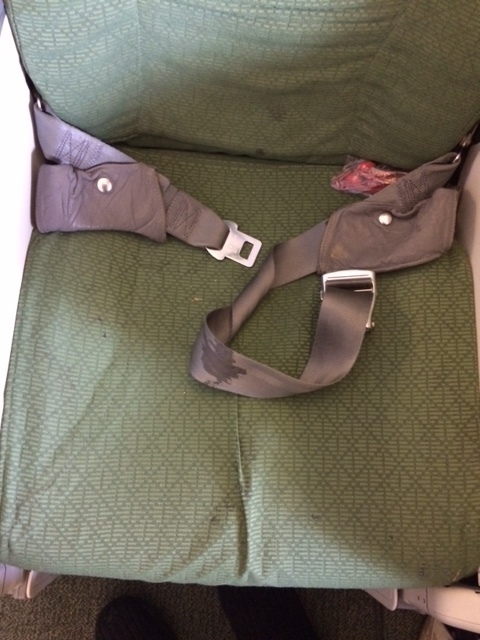 Is it the horrendous 1 hour delay I had to endure at EWR while waiting for the flight technician to fix the dislocated chairs (see pictures)? ; or the defunt tv monitor I had to stare at for over 13 hours? ; or the fact that my suitcase has been missing for 6 weeks now and they still can’t find it? Ethiopian Airline is a DISGRACE and I give it 0 stars. Save more money and fly with a better airline. It’s not worth it. I was so confused. I thought we were about to land in Canada and I heard the Captain say, we are now in Rome. I thought I was on the wrong flight. mmmm in fact…my dad didn’t let me hear the last of it…”so you used Ethiopian Air? If I was paying for your ticket would you have selected Ethiopian Air?”…”this trip cost you almost 5k when you consider all the wasted time and inconveniences…you’d have just bought a business class ticket”…lol. abeg I’ve learnt my lesson! Your experience with Ethopian Airline was a luxurious one compared to what I had with Air India. The only good thing about that flight was that I am still ALIVE! oh wow! where were you going? Wow.. My opinion.. Worst flight..
We could let them know about this.. It was pretty terrible. Won’t use them again!